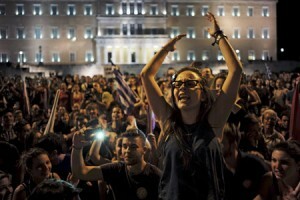 Referendum earthquake sees working class boldly defy Troika and Greece’s servile ruling class! 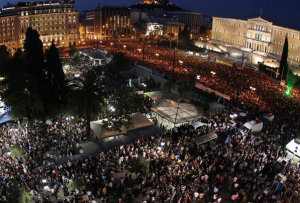 Yesterday’s Greek referendum saw the working class gave a powerful reply to the attempts of the Troika/Institutions to blackmail them into accepting more austerity in order to stay within the Eurozone. The referendum on Sunday 5 July produced a tremendous 61.5% in favour of NO (to the demands of the Eurozone leaders) and only 38.5% in favour of the YES vote. The Yes vote was campaigned for by the Greek ruling class, the mass media, the EU institutions and the ruling classes internationally. But the No vote was won by a landslide. The results show that all areas of Greece and the overwhelming majority of society voted No. According to pollsters, 85% of youth under 24 years voted No, 71% of workers in the private and public sector, 72% of the unemployed and 87.3% of Syriza voters. Significantly 86.9% of KKE voters voted No. This was despite the sectarian position taken by the KKE (the Greek Communist Party) leadership, which decided to abstain in the historical battle by the Greek working class against the Greek ruling class and the Brussels-based EU elite. Important numbers of small business people and other ‘middle layers’ in society also voted No. 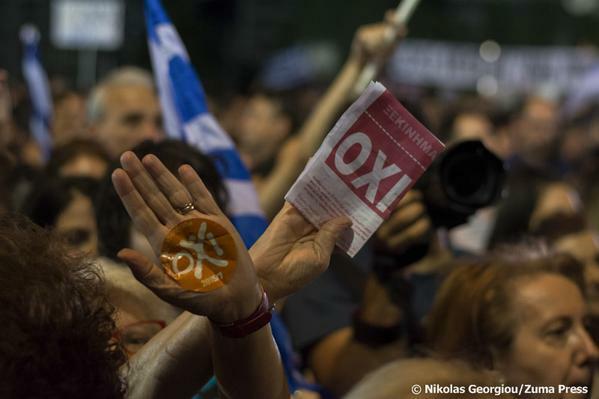 The propaganda campaign for a Yes vote by the Greek media was unprecedented. It was helped by the terrible mistakes made by the Greek government in the so-called “negotiations” over recent weeks, which led to the closure of Greek banks at the time of the referendum. This was made full use of by the ruling class and the EU in their attempt to terrify Greek workers and youth from voting No. But their actions were to no avail. Prime Minister Alexis Tsipras was given an immensely powerful mandate by the scale of the No vote. However the manner in which Tsipras has used this outcome, so far, can only cause great concern. The first measure by Tsipras was to ask the Greek President to convene a ‘national council’ of the leaders of the main political parties (except Golden Dawn), in the name of ‘national unity’. The second was to ask Giannis Varoufakis, the Finance Minister, to step down from his position in order to appease the Troika lenders. These measures were not what the Greek masses mandated and expected from Tsipras and Syriza. Xekinima (CWI Greece) understood the historic significance of this referendum and fought a tremendous battle in favour of No. Xekinima distributed 100,000 leaflets in just five days and sold 2,700 copies of a special newspaper produced for the referendum. Xekinima made dozens of banners for the pro-No demonstrations and ran a major social media campaign. The text that follows is an editorial statement posted today on the Xekinima website alongside articles looking at the many aspects of the referendum “No” vote. On the one hand, were lined up workers, the unemployed, the poor and the youth. On the other hand, the Greek ruling class and its mass media, together with Troika representatives Schauble, Deisenbloom, Sultz etc. The pro-Yes side went beyond all its former excesses of reactionary and lying propaganda, of scaremongering, of blatant lies and cynicism. They provocatively broke every pre-election media laws, projecting their own positions without any attempt to show any kind of objectivity last week leading up to the referendum. Ruling classes around the world also joined the attempt to terrorize the Greek working class into voting Yes. But Greek workers, the unemployed and the poor replied with an earth-shattering message: we’re not afraid of you and we will not bow our heads! This “No” was a clear, class-based “No.” It is not a “No” of all the Greeks but a “No” of the Greek workers and poor and sections of the middle classes against the “Yes” of the Greek rich and the capitalists. It was an overwhelming vote against the Yes of the President of the Greek Republic, P. Pavlopoulos, against the ‘fashionable’ River party, against the Yes of assorted ‘experts’, ‘specialists’, ‘economists’ and ‘professors’. It was also a vote against the Yes of the right wing, pro-establishment journalists, some of whom were filmed crying by Austrian TV cameras over the perils of finding ourselves outside the Eurozone. But we have not seen any of these journalists cry for the livelihoods that have been lost in Greece over the last few years of deep austerity, for those working eight or ten hours a day and only getting paid for three or five of those hours, or for the pensioners who receive a paltry 300 or 400 euros a month. 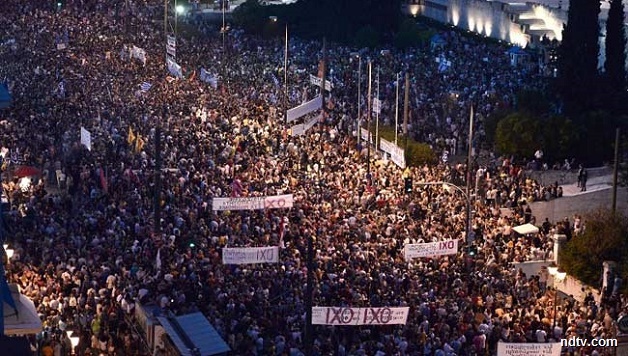 The powerful “No” vote also echoed the views and hopes of millions of workers across Europe who gave strength to and received inspiration from the struggle of the Greek workers. Many of them are also resisting their own ruling classes. There were 250 demonstrations and rallies across Europe in solidarity with the Greek workers in the three days around the referendum. There is simply no precedent in contemporary history for this, either in Greece or anywhere in Europe. Once again it becomes absolutely clear that there exist two ‘Europes’. On the one hand, that of the rich, of the multinationals and of Eurogroup. On the other hand, that of the workers, of the unemployed, of the poor and the youth! “Our” Europe is the latter – and only this one! The Greek working class “No” vote sends a very strong message of resistance across Europe and the whole world, as was the case in previous years with the Venezuelan workers, the Bolivian people and the rest of the peoples of Central and Latin America. And the mighty “No” vote is linked to major political developments – a process of radicalization of the working class and youth – that we have had in a number of industrialised countries in the recent past, particularly in Spain, Ireland and even the USA. The No vote is a victory that opens up new processes and pushes forward the struggle of workers in Europe and internationally and towards new class battles. Sunday’s vote also assists the process of the creation of new left formations. The No victory also shows how false, unhistorical and unrealistic is the oft repeated argument of some Lefts, who insist that the policies of “rupture” with the Troika and determined mass struggle will “isolate” the Left from the rest of society. Sunday showed precisely the opposite. The greatest support that SYRIZA ever received, before and since entering government, was during the referendum. At last, it left the pantomime, so-called “negotiations” in order to fight the Troika “beasts” out in the open. Let this be remembered by all the various stripes of “realists” who will undoubtedly come to the surface again to lectures us about what is to be done. But the SYRIZA government must also take note of Sunday’s results. They made unacceptable concessions to the Troika before the referendum. They agreed to cuts worth 8 billion euro (over 18 months) in order to come to a compromise with the determined enemies of the Greek people and the peoples of Europe. Going from retreat after retreat, the Greek government, in the end, was trapped and only at the last minute realized that the real aim of the Troika/Institutions was to ridicule and humiliate SYRIZA and to cause the Greek government’s fall. Only then did the Greek government decide to turn to the Greek people and ask for support. And, of course, Greek workers defended the government in this battle. The Greek masses did it in such a magnificent way that neither right wing German Finance Minister Schauble nor the rest of the lenders gang of the Troika, and not even the Greek government itself, could have imagined. Following the landslide No vote, will the Greek government respond to the expectations of the Greek people? Or will it continue to have illusions in its so-called “partners” and the various Institutions? Will it stand by the clear No mandate of the Greek people, refusing to retreat from its pre-election promises (i.e. the ‘Salonica Programme’)? Or will the SYRIZA government accept a new Memorandum and more austerity (albeit a bit milder than that of the previous government of the right wing New Democracy and ‘social democratic’ PASOK) in the cause of remaining within the Eurozone? The truth is that it is not possible within the confines of the capitalist system and the boss’s Eurozone for SYRIZA to be consistent with its declarations and pre-election promises to the Greek people. In the run up to the referendum the various European “partners” (i.e. those of the Greek ship owners and big bankers) had shown their real, ruthless, inhuman and cynical character. Does the leadership of SYRIZA and the government think that these EU ‘partners’ can suddenly change and become socially sensitive to the plight of the Greek people? Does Tsipras think that by convening a national council of the main political leaders and that by sacking Varoufakis (because the Troika lenders demand so, immediately after the fantastic No victory) he can appease the Troika/Institutions? No, the Troika lenders will not be satisfied! With such actions the only thing that Tsipras can achieve is to send out negative, confusing messages and to disappoint many Greeks who campaigned hard for a “No” vote. These workers and youth fought against the lenders and austerity and not in favour of the euro, as the ruling class and big sections of the SYRIZA leadership claim. If the Greek government attempts to come to a new agreement with the Troika, on the basis of a new Memorandum to satisfy their demands, it will have turned its back on the mighty No declaration of the Greek people. It has no right or mandate to take such action! Xekinima (CWI Greece) calls for SYRIZA to be consistent with its pre-election anti-cuts pledges, to break with austerity and to adopt a socialist programme. This includes refusal to pay the debt; controls on capital flows; for the state monopoly of foreign trade; the nationalisation of the banks and the commanding heights of the economy, under democratic workers’ control and management; reversal of austerity; jobs for all, with a living wage, and free, quality health, education and welfare. Planning the economy for the needs of the people and not the profits of the capitalists – the socialist re-organisation of society – would see an end to economic crises, poverty, joblessness and forced emigration. To achieve this it is essential to build independent class politics, inside and outside of SYRIZA. Following the enormous No rallies last week across Greece, continue, deepen and expand the active participation of the working class and youth in the struggle against the Troika and for a socialist alternative. This means the creation of popular assemblies and action committees of the rank and file in workplaces and communities. Appeal to workers and youth across Europe to fight austerity and for a socialist Europe.